My wandering around Cologne brought a couple surprises that both touched me. Easily the main tourist sight (and some residents say only sight!) in Cologne is the Cathedral. It may be only that I had no expectations of it, but I was surprised to find it much more impressive than others I have been in. That may only be because I had high expectations for Notre Dame or Montmartre or Westminster, where I really had none for Cologne. This cathedral was just massive, and the interior elements all moved everything in one direction in a far more dramatic way than I have experienced. Everything moves up. Where other cathedrals have beautiful elements moving your eye in all directions, everything here seemed to just pull your eye in one direction. You can't help but be struck by it. Another discovery I loved was on the nearby Hohenzollern Bridge. I had noticed on the train into town that as we pulled into the station, there seemed to be what looked like pieces of colored glass attached to the bridge catching and reflecting the light as we passed by. I realized that these were actually padlocks. It seems that this is a tradition in several cities around the world that is believed to have started in Italy. 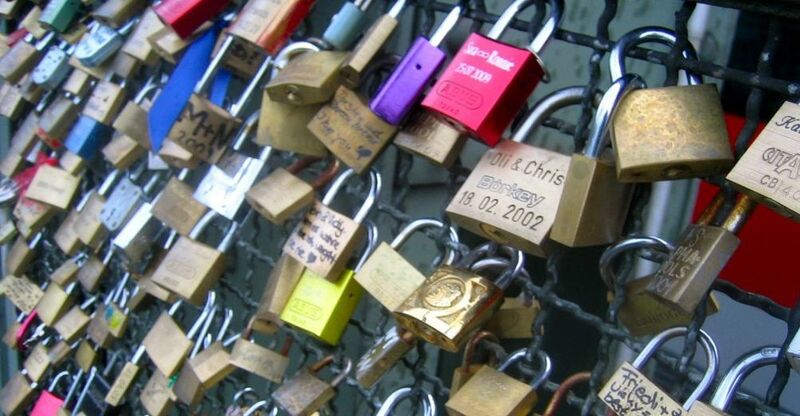 But for some unknown reason, these padlocks began appearing on this bridge in Cologne in 2008. In time, they have multiplied. When Deutsche-Bahn, the owner of the bridge, threatened to take them down, public outcry convinced them to change their mind. Often called Locks of Love, most have inscriptions - some clearly done professionally and other hastily scraped in or written with marker, usually with names and a date. Something about them just seems intensely personal, and like the cathedral, it touches you in an unexpected way.